Microsoft is bringing new innovations to customer relationship management (CRM) software with Microsoft Dynamics® CRM. It is a flexible CRM solution that fits your people, fits your business, and fits your environment. This document outlines the future direction of Microsoft Dynamics CRM through to the next major release, Microsoft Dynamics CRM "V.Next" which is targeted for release in 2010. We expect to update this document with further details periodically. Microsoft Dynamics CRM launched in 2003 with versions 1.0 and 1.2 [2.0], followed by version 3.0 in December 2005. The current release, Microsoft Dynamics CRM 4.0 was released in 2007 and delivers enhanced capabilities across sales, service and marketing. The Microsoft Dynamics CRM 4.0 architecture supports multi-language and multi-currency requirements as well as multi-tenancy for enterprise and on-demand deployments. Microsoft Dynamics CRM 4.0 also delivers extensive reporting through Microsoft SQL Server® and enterprise workflow through Windows® Workflow Foundation. The primary goal from the very first release of Microsoft Dynamics CRM has been to deliver a solution that users feel comfortable working with and is a natural part of their daily work activities. Our objective has been clear; to drive maximum user adoption of the solution by delivering it through standard and familiar Microsoft desktop applications that users know and understand.  On-premise: customers may choose to purchase the licenses and run the application on their own servers.  On-demand: customers may subscribe to the software on a per user per month basis from one of many global hosting partners or directly from Microsoft. Our mission is to deliver software and services that enable extraordinary customer relationships with world-class business results. This document is structured around the major areas of innovation over the next two years, namely Microsoft Dynamics CRM 4.0, Microsoft Dynamics CRM Online, xRM and Microsoft Dynamics CRM "V.Next"
NOTE: This document is not intended to be a detailed specification; it needs to be noted that individual features may be added, amended or dropped during these timelines.  Continued investment in the CRM capabilities enriching the extensive Sales, Customer Service and Marketing functionality.  Windows Workflow Foundation to provide a world-class enterprise workflow capability.  Multi-currency and Multi-language support for customers with global deployment demands.  The power of choice over how to deliver and consume Microsoft Dynamics CRM; whether that is via an on-demand Software-as-a-Service (SaaS) or installing it on-premise, i.e. their own servers located in their own data center. The customer can move from on-demand to on-premise (and vice-versa) at any time while preserving their customizations and data.  Integration with Microsoft’s Unified Communications platform to embed "presence", i.e. the ability to see a customer or colleague’s status such as Available, Busy, Away etc. and then interact with them via phone, email or instant messaging. There is a defined plan of rapid innovation for Microsoft Dynamics CRM 4.0 customers and partners which delivers additional capabilities such as mobility, BizTalk® integration, SharePoint web parts, CRM Accelerators and regular service updates to the Microsoft Dynamics CRM Online service. Customers and partners have a number of mobile CRM solution options both directly from Microsoft and through our partners. Microsoft has released a new version of Mobile Express for Microsoft Dynamics CRM which runs on any mobile device that supports HTML 4.0 browsing and is available at no cost. Additionally, Microsoft has formed an alliance with Ten Digits to provide their mobile solution (MobileAccess 4.0) for both Microsoft Windows Mobile and Research-In-Motion (RIM) Blackberry® customers; these solutions are available at a range of prices. Microsoft System Center Mobile Device Manager 2008 provides over-the-air management of Windows Mobile phones and security-enhanced access to corporate data behind the firewall. Mobile Express for Microsoft Dynamics CRM 4.0 delivers the power of Microsoft Dynamics CRM to your mobile workforce with ease. The Mobile Express client provides users the ability to view, create, and modify their CRM data on just about any internet capable device. There is no installation required on the mobile devices to enable this functionality. Additionally, an 6 MICROSOFT DYNAMICS CRM – STATEMENT OF DIRECTION administrative interface is available to enable organizations to control what and how users view their CRM data on the mobile device. The new release of Mobile Express for Microsoft Dynamics CRM 4.0 is fully supported by Microsoft. The client uses common metadata from Microsoft Dynamics CRM so users can access all built-in and custom entities within CRM and system administrators can configure Mobile Express using the same tools they use to configure the solution for all users. The new release has been optimized for limited bandwidth environments and works on any HTML 4.0 Web browser and requires no client-side script or installation on the client device. Additionally, Mobile Express for Microsoft Dynamics CRM 4.0 works with the multi-tenanted architecture of Microsoft Dynamics CRM 4.0 allowing users to point at different organizations from the same device. Initially, Mobile Express is available in English only. However support for all standard Microsoft Dynamics CRM languages will be available in Q4 2009. Microsoft Dynamics CRM Online customers will have access to Mobile Express in the next service update which is due in November 2009. Mobile Express for Microsoft Dynamics CRM 4.0 is now available here. Microsoft and Ten Digits Software Inc. have an alliance which delivers full-featured mobile access to both Microsoft Windows Mobile phones and BlackBerry® mobile phones for Microsoft Dynamics CRM 3.0 or 4.0. MobileAccess® is developed and distributed by Ten Digits and extends rich client access to Microsoft Dynamics CRM 3.0 or 4.0 for users of Windows Mobile phones and Research in Motion (RIM)-based BlackBerry® mobile phones. This solution gives organizations the choice and flexibility to meet the requirements of their users while giving them anytime, anywhere access to Microsoft Dynamics CRM 3.0 or 4.0. MobileAccess® provides access to Microsoft Dynamics CRM functionality while offline to help fuel the productivity and responsiveness of remote employees and partners. 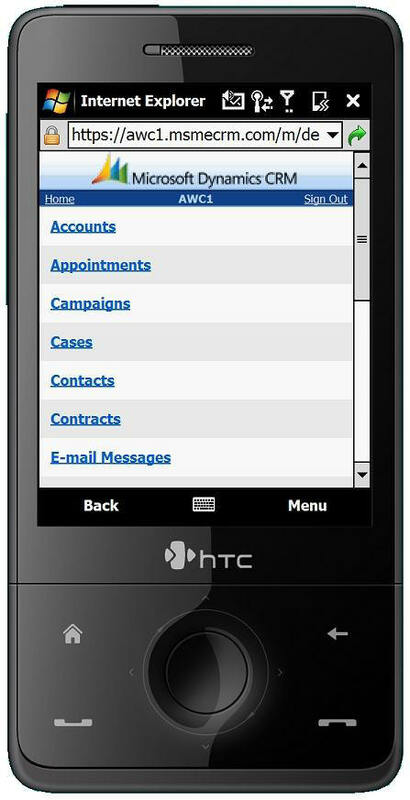 MobileAccess® is administered within Microsoft Dynamics CRM 4.0 which helps minimize IT management overhead and setup. During late 2008 and early 2009 Microsoft released the first wave of accelerators for Microsoft Dynamics CRM 4.0. Accelerators for Microsoft Dynamics CRM 4.0 are a range of free-of-charge add-on solutions developed for Microsoft Dynamics CRM 4.0 customers and partners. Each accelerator showcases how the Microsoft Dynamics CRM 4.0 platform can be configured and extended to broaden marketing, sales and service capabilities. Additionally, CRM Accelerators provide the building blocks for all kinds of xRM applications. Each accelerator is supported as per any other customization that follows SDK guidelines. All accelerators are supplied with full source-code so they can be extended further to meet specific customer requirements. Because of Microsoft Dynamics CRM’s services-based architecture and metadata-driven application capabilities, accelerators can be easily deployed for both on-demand and on-premise environments. Several of the accelerators have been released for Microsoft Dynamics CRM Online customers. More accelerators will be provided for on-demand customers during 2009/2010. Through accelerators, customers and partners benefit from new functionality on a more frequent basis, and they can be deployed to their environment quickly and easily. You can download all accelerator releases from here. Analytics Accelerator R2 was released in June 2009 and provides a number of new dashboards for SQL Server 2008 as well as enhancements to the SQL Server 2005 dashboards. 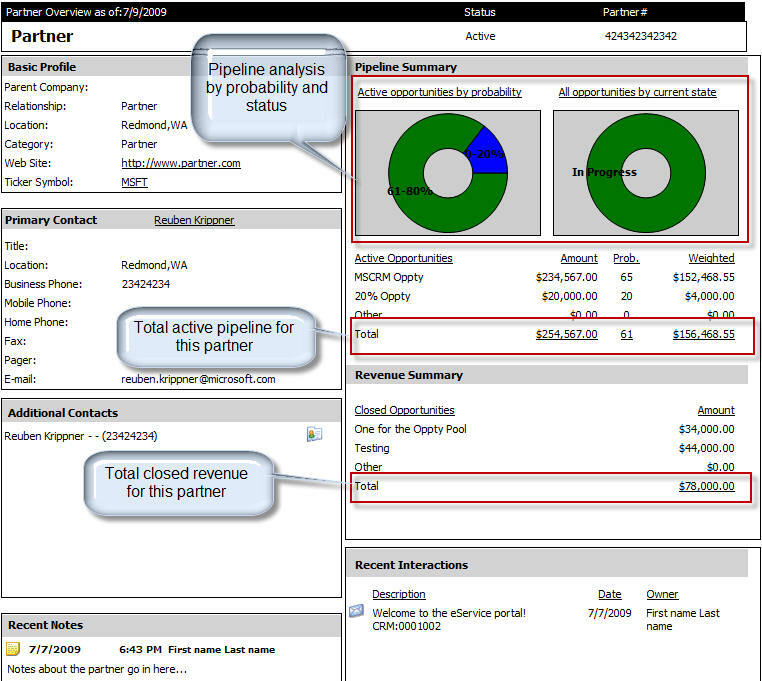 Click here to download the latest Analytics Accelerator for Microsoft Dynamics CRM release. The Business Productivity Newsfeed Accelerator turns Microsoft Dynamics CRM 4.0 into the hub of business activity, letting users keep up to date on events happening across the organization. The Business Productivity Newsfeed Accelerator drives user adoption by presenting CRM data to users in a way that is appealing and interactive, drawing them into the application and encouraging use. Click here to download the Business Productivity Newsfeed Accelerator for Microsoft Dynamics CRM release. this accelerator is installed workflow designers within Microsoft Dynamics CRM have more flexibility in terms of the processes they can manage through workflows. Click here to download the Business Productivity Workflow Tools Accelerator for Microsoft Dynamics CRM release. The Business Data Auditing Accelerator provides basic audit capabilities for organizations using Microsoft Dynamics CRM. The accelerator takes a snapshot of a record whenever the relevant event occurs within the system such as Create, Update, Assign and Delete. Through workflow, auditing can be configured for any entity and any trigger event. Click here to download the Business Data Auditing Accelerator for Microsoft Dynamics CRM release. The Miller Heiman® accelerator for Microsoft Dynamics CRM 4.0 is for customers who have invested in or are looking to invest in Miller Heiman’s sales methodologies and would like to leverage this investment through Microsoft Dynamics CRM. Miller Heiman offers a solution called Sales Access ManagerSM which integrates Miller Heiman's planning worksheets for Conceptual Selling® (Green Sheet), Strategic Selling® (Blue Sheet) and the Large Account Management Process SM (Gold Sheet) into Microsoft Dynamics CRM 3.0 or 4.0. This accelerator provides advice and guidance for customers on their options for deploying Sales Access Manager in conjunction with Microsoft Dynamics CRM. This accelerator is planned to be released in Q3 2009.  Basic Edition: provides a Solution Selling® template which can be downloaded at no cost.  Professional Edition: provides a more fully-featured application. NB: There is a charge for this solution. Click here to download the Sales Performance International (SPI) Sales Methodology Accelerator for Microsoft Dynamics CRM. incorporates TAS sales methodologies and sales processes. This accelerator provides advice and guidance for customers on their options for deploying Sales Access Manager in conjunction with Microsoft Dynamics CRM. The Social Networking Accelerator allows an organization to reach new prospects and engage in real-time dialogue across social networks. 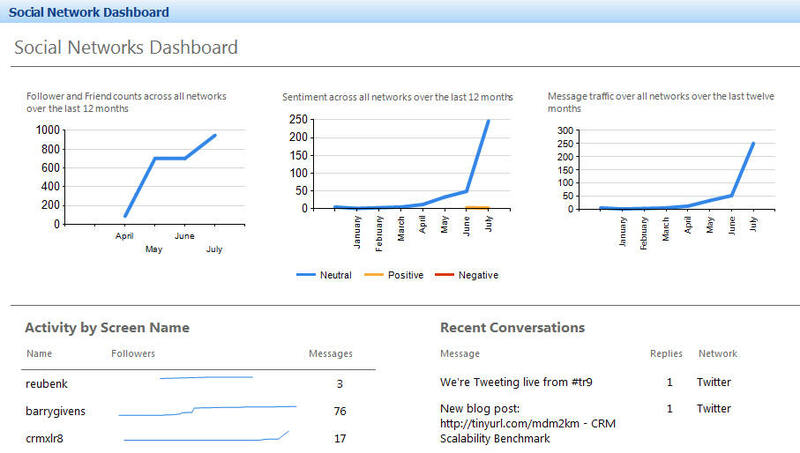 Using this solution, an organization can push real-time communications from Microsoft Dynamics CRM into social network sites – like Twitter, and harness the native business intelligence of Microsoft Dynamics CRM to analyze sentiment, optimize message reach, and automate sales and customer service activity and process. The Social Networking Accelerator enables organizations to monitor conversations, identify influential people, and participate in the conversation, all within the Microsoft Dynamics CRM application. mobile devices, SMS, Web browsers and standalone PC clients, these new communication tools provide organizations a way to maintain a persistent connection with their customers or constituents. Microsoft Dynamics CRM enables organizations to manage customer interactions across multiple channels; Microsoft Dynamics CRM with the Social Networking Accelerator enables communication and community managers to add social channels to their interaction management strategy. Working across multiple social networking sites at once, marketing professionals can identify their most influential consumers and initiate or take action on critical conversations. 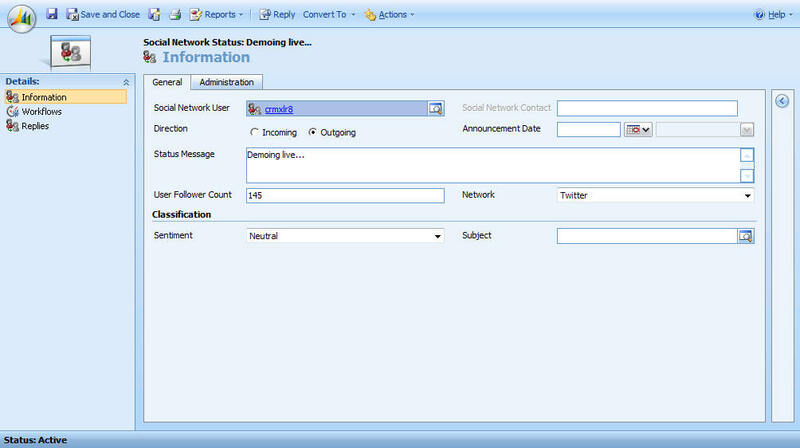 The solution has been created as a multi-network engine in which organizations can combine conversations and insight from numerous social networking sites, but is enabled for Twitter in the initial release. Other networks such as Facebook and LinkedIn will be introduced in future releases. Initially this accelerator will be provided for on-premise customers only. Future releases will provide capabilities for Microsoft Dynamics CRM Online customers. 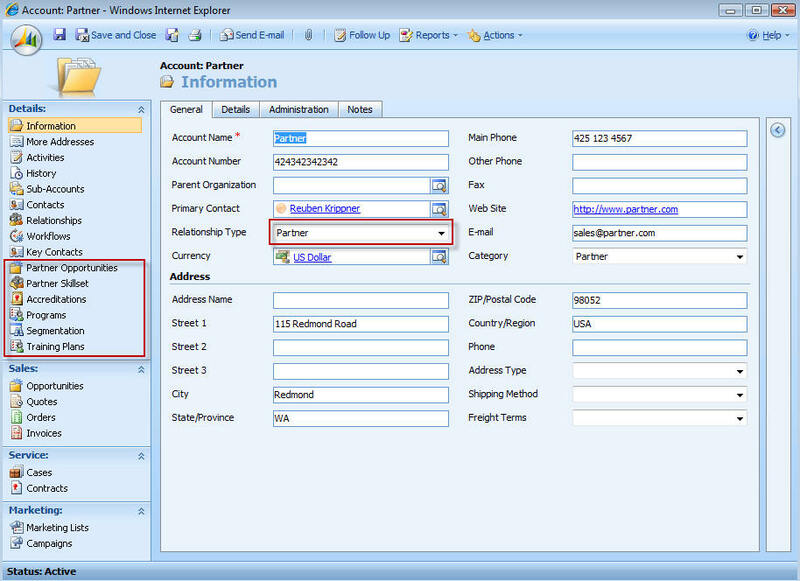  Customizations for Microsoft Dynamics CRM to manage web accounts and portal system settings.  Membership integration with .NET membership.  Membership invitation workflows and plugins to manage the creation of portal accounts.  Configuration console which plugs into the CRM application and allows you to configure web forms for any entity within CRM (including custom entities).  Configurable web portal transaction audit workflows.  A base configuration and sample portal which provide web to lead capture functionality for Microsoft Dynamics CRM.  A base set of ASP.NET user controls which can be dropped into ASP.NET web sites to construct web portals connected to Microsoft Dynamics CRM. The engine behind the portal integration accelerator is a slightly revised and enhanced release of the eService web portal engine delivered in 2008. It has been broadened in scope and capability to allow organizations more flexibility with the functionality they offer through their web portal. All existing eService configurations will continue to work with the new portal integration framework. Initially this accelerator will be provided for on-premise customers. However, source code is provided for customers who wish to utilize it with Microsoft Dynamics CRM Online. Future releases will provide information on how to deliver this accelerator via the Windows Azure™Platform. The PRM Accelerator allows businesses to use Microsoft Dynamics CRM to distribute sales leads and centrally manage sales opportunities across channel partners. Using the PRM Accelerator, companies can jointly manage sales processes with key businesses partners using a centralized web portal as well as extend this integration to automate additional business processes using custom CRM entities and workflows.  The portal framework sits on the web interaction management accelerator platform. NB: eService 1.0 configurations will continue to work when you upgrade to the 2.0 platform. This accelerator is planned to be released in Q4 2009.  The event registration page is now completely configurable and accommodates custom attributes in Microsoft Dynamics CRM.  The portal framework sits on the web interaction management accelerator platform. NB: Event Management 1.0 configurations will continue to work when you upgrade to the 2.0 platform.  Use Microsoft Dynamics CRM as a send adapter.  Discover and use the schema of any Microsoft Dynamics CRM actions and entities. The current release of the Microsoft BizTalk® Server 2006 Adapter for Microsoft Dynamics CRM 4.0 supports 32 and 64 bit Microsoft Dynamics CRM editions, multi-tenancy, and forms authentication (IFD). Additionally, it is supported on both 32 and 64 bit editions of Microsoft BizTalk Server 2006. A new release of the adapter is targeted for Q3 2009. This release will provide the same capabilities to work with Microsoft BizTalk Server 2009. The List Web Part for Microsoft Dynamics CRM 4.0 provides a way to view and update Microsoft Dynamics CRM 4.0 records using a SharePoint site. Microsoft Dynamics CRM users can create shared or personal lists of Microsoft Dynamics CRM records from a SharePoint Web site, open records in Microsoft Dynamics CRM 4.0 from the List Web Part, and create connected List Web Parts. Currently the List Web Part for Microsoft Dynamics CRM 4.0 supports on-premise and Internet Facing Deployments (IFD). Click here to download the List Web Part for Microsoft Dynamics CRM 4.0. New and enhanced capabilities will be made available for the Outlook clients. This release will ensure customers can use this client with Microsoft Office Outlook 2010, and improve the synchronization process between Microsoft Dynamics CRM and Microsoft Outlook in terms of contacts, tasks, emails and appointments. The enhanced Outlook clients will be available for Microsoft Dynamics CRM customers in Q4 2009 and specifically for Microsoft Dynamics CRM Online customers as part of the November 2009 Service Update. The Microsoft Dynamics CRM Adapter for Microsoft Dynamics GP is an integration solution for these two products. The primary emphasis of the solution is simplicity and ease of use while providing a highly reliable, bi-directional and fault tolerant business document integration between Dynamics CRM 4.0 (Update Rollup 5 and above) and Dynamics GP 10 (Service Pack 4 and above). The solution does not require any additional software such as Microsoft BizTalk server and is available at no cost to licensed customers who have a current Enhancement Plan for Microsoft Dynamics GP. The system is based on a transformation engine and uses specific adapters to identify source and destination systems. The source adapter reads data and the destination adapter writes data. There is a pre-defined and configurable map which ships as part of the solution to define the specific data in each system which will be exchanged. This map serves as a starting point for a customer but can easily be modified to meet specific needs using a map authoring utility provided with the solution. Fault tolerance is built into the solution; in the event of an integration failure, the solution will retry failed documents according to configurable rules. The Microsoft Dynamics CRM Adapter for Microsoft Dynamics GP is planned to be released in Q4 2009. On-demand Microsoft Dynamics CRM allows customers to access their everyday productivity applications over the Internet to drive effective marketing, sales and customer service. On-demand Microsoft Dynamics CRM equips business professionals with online and offline access to customer information through a full suite of marketing, sales and service solutions within a familiar Microsoft Office Outlook interface to help ensure rapid user adoption and fast results. On-demand Microsoft Dynamics CRM is flexible for users as they can also access it through a web browser; this allows users to work in the environment that they feel most comfortable with and understand. Organizations can start using the marketing, sales and service capabilities in their on-demand Microsoft Dynamics CRM application immediately. They can utilize the intuitive configuration capabilities to quickly add or modify fields, forms, workflows and reports to tailor it to fit their business needs. Microsoft Dynamics CRM is architecturally different from other CRM solutions in the marketplace in that the software which is run over the internet as a service is exactly the same application, data model and process definitions as that run by customers on their own servers. This architectural innovation allows a customer to start with an on-demand deployment but if they feel at any time it is more appropriate to transfer their Microsoft Dynamics CRM solution to their own servers they can do this at any time. All configurations and data can be moved to the new deployment. Alternatively, customers may choose to subscribe to on-demand Microsoft Dynamics CRM through Microsoft directly; this service is called Microsoft Dynamics CRM Online. Currently Microsoft Dynamics CRM Online is available in the United States and Canada and is expected to be available in all major international markets mid-2010. Final planning is under way and further announcements will be made during 2009. Between now and the release of Microsoft Dynamics CRM "V.Next" there is a separate release timetable for Microsoft Dynamics CRM Online. Each release (referred to as a service update) will add additional features and value to the Microsoft Dynamics CRM Online platform. Delivering on the promise of continued innovation, Microsoft released the second service update for Microsoft Dynamics CRM Online in March 2009. The release included an industry-leading uptime service level agreement (SLA) along with new features that provide customers and partners with more value at no additional cost.  A financially backed 99.9 percent uptime service level agreement (SLA) to all customers. This SLA gives businesses a high level of trust and confidence in Microsoft that its operations will have access to mission-critical systems. 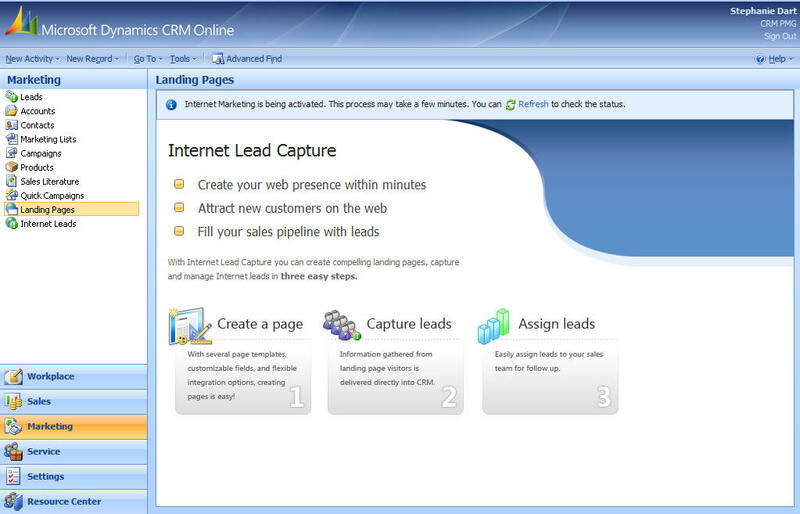  New Internet Lead Capture capabilities enable customers to drive qualified leads into the sales pipeline. Wizard-generated landing pages enable marketing and sales professionals to quickly and easily create custom Web landing pages for large-scale marketing campaigns or localized sales representative campaigns, all without IT support.  Cloud integration services provide customers and partners with security-enhanced authentication to integrate and develop on-premises or on-demand applications that work with Microsoft Dynamics CRM Online. Developers and independent software vendors (ISVs) can obtain full access to data and metadata APIs to leverage a wide variety of integration capabilities with Microsoft Dynamics CRM Online.  Enhanced usability for new users through a set of tools to further enhance user adoption. New users can familiarize themselves with Microsoft Dynamics CRM Online quickly by using a new Get Started page that provides tips on key functions, a product tour and best practices. As part of Microsoft’s commitment to ongoing innovation and customer success with the Microsoft Dynamics CRM Online platform there is currently a service update in the final stages of development and testing as well as a roadmap of service updates in detailed planning. Many partners and customers have adopted Microsoft Dynamics CRM 4.0 as a generic business application development platform. Organizations can rapidly configure a tailored business application not associated with the traditional customer relationship management pillars of sales, service and marketing. Examples of these applications include human resource management, vendor management, IT helpdesk, public sector citizen management, and grant management. Microsoft refers to these types of solutions as "xRM". Every day countless business requests go unmet because line-of-business (LOB) applications do not get funded. Most organizations meet their business process automation needs through the development of custom applications or the acquisition of packaged applications. Often times these solutions do not fulfill every business requirement. Custom applications can be extremely expensive to develop and maintain. Research has identified that it will cost a company from seven to ten times more to develop a particular functionality than to purchase comparable functionality. The costs and risks associated with developing highly specialized LOB applications are truly prohibitive. Packaged applications, while easy to deploy, do not fit the business and can be very difficult to change once they are deployed. xRM offers an alternative and the best of both worlds; it accelerates the creation of LOB applications, and it makes it easy to modify existing applications in response to ever-changing business needs. Customers today have a wealth of capabilities at their disposal with the Microsoft Dynamics CRM 4.0 platform including multi-tenancy, multi-currency, multi-lingual, role-based security, Windows Workflow Foundation, configurable data schema and UI, extensive BI and Office integration. These platform features alone would take many months or years to develop; this is even before tackling the application functionality development effort. Microsoft is committed to long-term investment in the Microsoft Dynamics CRM platform to allow customers and partners to build out flexible and cost-effective solutions. Development and testing is in progress for Microsoft Dynamics CRM "V.Next" which encompasses several milestone builds before various external feedback and testing programs are initiated with customers and partners in the lead-up to general release. There is an exhaustive list of investments in Microsoft Dynamics CRM "V.Next" which ranges from small "tweaks" and enhancements to broad new feature areas. The following sections provide a summary of some of the investments across the three categories. Customers, partners and the analyst community continue to agree that the primary reason why a CRM solution may fail is simply that the users within an organization don’t use the software! A key product strategy for Microsoft Dynamics CRM "V.Next" is to continue to provide a CRM solution that users want to work with, is as familiar as their regular desktop software such as Microsoft Office and allows them to more effectively manage their day-to-day commitments and customer interactions regardless of their role. Building on the success of Dynamics CRM 4.0, Microsoft is committed to further investing in a rich and satisfying user experience leveraging both Microsoft Office and Windows. Continue to improve the end-user experience: focus on providing further flexibility for a user to set up their role-based view of the system quickly. With each new release of Dynamics CRM Microsoft has reshaped how CRM functionality can be delivered through Microsoft Office Outlook to drive a more natural user experience. Microsoft Dynamics CRM "V.Next" will further enhance the user experience and information view of CRM data within Microsoft Office Outlook to ensure simplicity and ease of use. Increase accessibility through the Microsoft Office "ribbon" interface: provide a user experience that is consistent with established Microsoft Office designs such as the ribbon interface. This style of interface is designed to increase efficiency and make it easier for users to find features to get their work done. productivity and insight as the key information or process can be accessed and accomplished more quickly and intuitively. Drive user adoption through personalization: allowing the user to drive how they want to interact with Microsoft Dynamics CRM and nominating which views of information are most relevant to their role. Facilitate collaboration with SharePoint® integration: Microsoft is working towards a business application platform that combines the customer view and interaction management strengths of Microsoft Dynamics CRM with the collaborative strengths of SharePoint. The most common scenario revolves around document management. The strategy is to open Microsoft Dynamics CRM to the world of Enterprise Content Management (ECM) provided by SharePoint. Enrich business insight through improved business intelligence: the objective is to provide an interactive analytical tool for a user that is simple to use. Rich contextual visualizations (charts and other graphical representations) can be configured and embedded within views of CRM records. 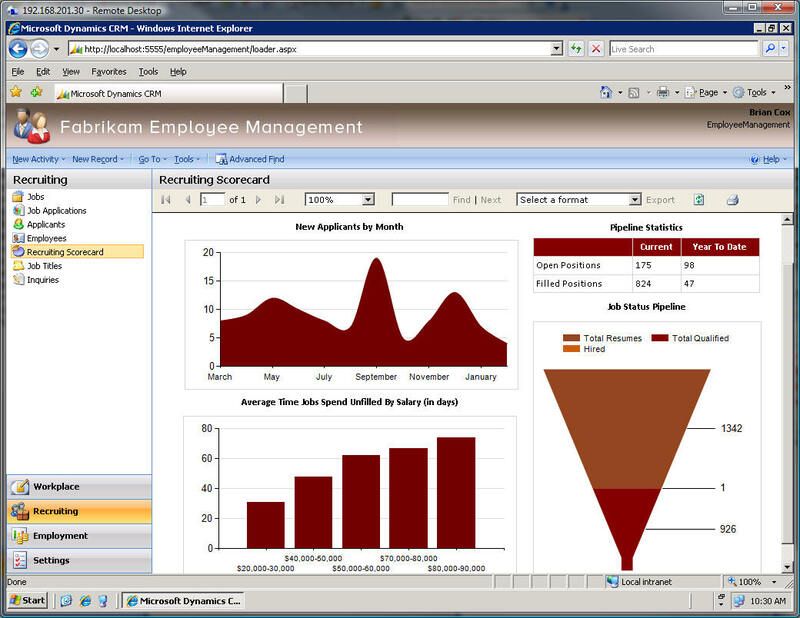 These visualizations can be placed into personalized dashboards so that each user can have a unique view of the system based on their role. Each visualization offers drill-through capabilities to allow users to drill into more detailed views of CRM data as required. Visualizations will include different chart types such as pie, bar, column, line and funnel. Users can rapidly configure filters for their visualizations to meet their specific requirements as well as employ mathematical formulae to summarize data. Balanced workload management for more efficient use of resources: providing a flexible means for organizations, divisions, departments, teams and individuals to group and prioritize work items. Microsoft is committed to broadening and enriching the core customer relationship management capabilities provided by Microsoft Dynamics CRM. In the next release there will be broad investment across sales, service and marketing functionality. The following section highlights some of the core CRM investments to be included in Microsoft Dynamics CRM "V.Next". Contact and Account Management: still the foundation of CRM; the goal is to further improve on the excellent contact and account management capabilities of Microsoft Dynamics CRM 4.0. This involves allowing users to even more effectively model and visualize customer organizational hierarchies while catering for varying degrees of complexity within those structures. The focus is to enrich the user’s view of their customers and make better decisions about which relationships should be pursued from a sales, service and marketing standpoint. Call Center and Unified Communications Support: providing users the means to accomplish more tasks with less keystrokes and mouse-clicks – this is vital in contact centers to improve customer interaction volumes. Contact centers need to deal with customers across channels such as Voice and Instant Messaging (IM). Working with Microsoft’s Unified Communications platform will provide even more capabilities for contact centers to leverage these channels with Microsoft Dynamics CRM. Extended Sales Territory Management: extending the territory management capabilities in Microsoft Dynamics CRM to facilitate more complex hierarchical territory structures. The focus here is to deliver even more flexibility in territory definition to incorporate geographic-based, industry-based and product-based sales territories. Utilizing this framework there will be an even broader range of lead allocation options across sales territories which can then be further tailored to the customers’ requirements through configuration. Knowledge Management: broadening the knowledge search capabilities to reach many different content repositories both internal and external to Microsoft Dynamics CRM. Additional capabilities will be provided for authoring content in the Microsoft Dynamics CRM knowledge base (KB) including an even richer editor and the ability to attach documents to articles. Further flexibility will be provided in how KB articles can be structured and secured for specific organizations, business units, teams, groups or individuals.  Additional capabilities around revenue recognition, forecasting and revenue management.  Further improving the flexibility of sales opportunity management to incorporate team selling models.  Extending the outbound marketing capabilities to allow richer communications via email, including document attachments.  Further simplifying and extending marketing list management capabilities.  Providing users the ability to schedule future recurring activities. Microsoft Dynamics CRM 4.0 has delivered a rich business application platform that is highly flexible, scalable and configurable. Microsoft is committed to further invest in the "V.Next" platform to facilitate even faster and easier development of CRM and xRM applications. Microsoft will invest further in the application platform to enable more partners and customers to rapidly configure and develop business solutions with Microsoft Dynamics CRM. From a customer standpoint this continues to deliver on the "Power of Choice" vision for Microsoft Dynamics CRM which enables organizations to choose the appropriate consumption model either on-premise or on-demand. versioning. Thus the underlying technology platform becomes an application engine to run a whole range of business applications. As with Microsoft Dynamics CRM 4.0, this application platform will be multi-tenanted and is therefore hosting ready. Imagine the possibilities of an application platform that can be readily configured, is enterprise scalable, provides extensive enterprise workflow capabilities and has the integration hooks with Microsoft Office and SharePoint! Secure Code on the Server: Microsoft Dynamics CRM 4.0 allows code on the server (for plug-ins or workflows) but that code runs in full trust. The challenge here is to protect the Microsoft Dynamics CRM server from poorly secured code and poor application logic to preserve system integrity and performance. Microsoft Dynamics CRM "V.Next" will deliver platform capabilities around profiling, tracing and isolation levels to ensure that both on-premise and large on-demand environments alike can run securely and efficiently. Microsoft Dynamics CRM "V.Next" will extend platform capabilities to tackle these integration challenges through a number of investments detailed below. Service-Oriented Architecture: Microsoft will continue to prioritize and enhance the ability for customers to integrate with Microsoft Dynamics CRM using industry standard web service protocols. Native Windows Communication Foundation (WCF) connectivity: by providing support for WCF, Microsoft Dynamics CRM "V.Next" further improves the capability to integrate the Microsoft Dynamics CRM web services into multiple contexts, including BizTalk and non-Microsoft clients such as Java™. Scalable, Federated security: in conjunction with the investments around further aligning industry standards support for connectivity with different platforms Microsoft Dynamics CRM "V.Next" will provide rich claims-based authentication using the new Windows Identity Foundation. This framework allows Microsoft Dynamics CRM "V.Next" to provide rich integration of authentication and authorization capabilities with a range of providers and scenarios. Extended Event Pipeline: another key investment in the integration choice model for Microsoft Dynamics CRM customers and partners is to leverage the Windows Azure™Platform to facilitate flexible, cost-effective integration between Microsoft Dynamics CRM and other applications both within and outside the organization. The Windows Azure Platform is a cloud operating system and collection of services that can deliver web, mobile, or hybrid software-plus-services applications to users. Existing software can 25 MICROSOFT DYNAMICS CRM – STATEMENT OF DIRECTION utilize the services to add cloud capabilities, and developers can easily write applications for the cloud to be used by end users, or write services that can be consumed within other applications. There are many components of the Windows Azure Platform such as Microsoft .NET Services for workflow, access control, or service bus functionality, or Microsoft SQL Azure for database. Specifically, Microsoft Dynamics CRM "V.Next" will provide capabilities to leverage Microsoft .NET Services. These services allow organizations and their business partners to bridge assets across cloud, on-premises, or hosted deployment locations, and to interoperate across languages, platforms, and standards. Microsoft .NET Services is based on industry standard protocols, making it possible for any service platform to integrate with it through standard REST, SOAP, and WS-* techniques. There are already Java and Ruby SDKs for Microsoft .NET Services available for download today. In order to meet the integration challenges outlined above, it’s common for many organizations to use an enterprise service bus (ESB) solution. However, these solutions can be time-consuming to implement and costly to maintain. The Microsoft .NET Service Bus is a core part of the Microsoft .NET Services focused on making the ESB pattern a reality at Internet scope as part of the Windows Azure Platform. The Microsoft .NET Service Bus provides many of the same architectural characteristics found in typical ESB solutions, including things like identity and access control, naming, a service registry, and a common messaging fabric. The Microsoft .NET Service Bus is designed to operate in the cloud in a highly scalable and federated manner. The Microsoft .NET Service Bus makes it possible to integrate your applications with your own services running in the cloud, with a variety of 3rd party services provided by Microsoft or other vendors (including those offered within the Windows Azure Platform), and with a variety of applications that may be running inside or outside of the corporate firewall. The primary objective of Microsoft Dynamics CRM "V.Next" integration with the Microsoft .NET Service Bus is around extending the eventing capabilities in the CRM platform to access services hosted in the cloud. It provides the ability to develop and utilize a "plugin in the cloud". The benefits of this approach are that you can easily develop and deploy application integration components which elastically scale according to your workload. 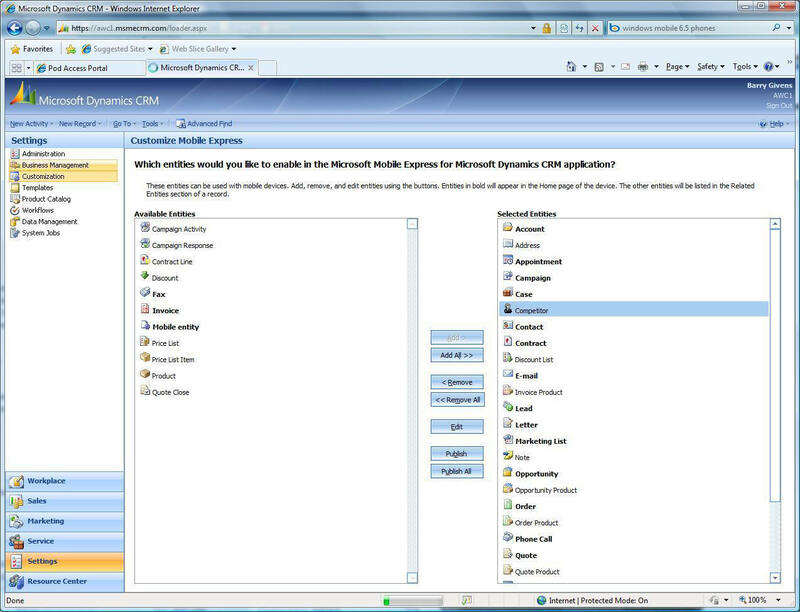 Using this feature you will be able to connect Microsoft Dynamics CRM "V.Next" to other applications that may be hosted on Azure, On-premise, or elsewhere. These other applications may be within your network or external to your organization and through the Microsoft .NET Access Control Service you have flexibility as to how you authenticate to these applications. The developer experience mirrors the development of a plugin and uses the same registration process as a plugin.  Business data auditing capabilities.  Extended utilization of the Windows Workflow Foundation platform.  Re-usable configurations such as global pick-lists and cascading/hierarchical pick-lists.  Improved Microsoft Visual Studio® integration for a smoother development experience.  Multi-tenant management – streamlined management for hosted environments.  Leveraging virtualization with Microsoft Windows Server® 2008.  Platform adjustments to take advantage of the improved performance and business intelligence capabilities of Microsoft SQL Server 2008.  An updated Microsoft BizTalk Server adaptor for Microsoft Dynamics CRM "V.Next". Coupled with these solutions will be continued focus and expansion of our on-demand Microsoft Dynamics CRM offerings whether that is through Microsoft directly (Microsoft Dynamics CRM Online) or our extensive global partner network. It is truly an exciting time to be implementing or evaluating Microsoft Dynamics CRM! Our mission is to deliver software and services that enable extraordinary customer relationships with world-class business results. This briefing document will be updated periodically between now and the release of Microsoft Dynamics CRM "V.Next". Our intention is to keep our prospective and current customers, partners and interested parties informed of the full Microsoft Dynamics CRM roadmap. We look forward to keeping you informed of the innovations and exciting capabilities that Microsoft Dynamics CRM will deliver for you now and into the future! Microsoft, the Microsoft Dynamics logo, BizTalk, Microsoft Dynamics, Outlook, SharePoint, SQL Server, Visual Studio, Windows, Windows Mobile and Windows Server are either registered trademarks or trademarks of Microsoft Corporation or Microsoft Business Solutions ApS in the United States and/or other countries. Microsoft Business Solutions ApS is a subsidiary of Microsoft Corporation. The names of actual companies and products mentioned herein may be the trademarks of their respective owners. Certified Microsoft Dynamics CRM Specialist Today!